Avocado on toast has become a popular snack over the last few years. It’s simple, quick and tasty and is great any time of day. Avocado is packed full of good fats, and makes a great snack or breakfast on the go. This is my take on the classic, inspired by middle eastern flavours with a kick of lime juice and a side of fresh mint tea to liven it up! Put the kettle on to boil for the tea, and put the tea leaves, mint and sugar in a strainer. Set aside for later. Cut the bread into slices for thick toast and pop them in the toaster. While the bread is crisping up, slice the avocado in half and squeeze out the pulp. Take the halved lime and squeeze the juice over the top. Mash with a fork to mix the lime through. Add half of the pomegranate seeds in and mix well. When the toast pops, leave it in the toaster and make the tea. This lets the bread crisp up before adding the toppings and gives the tea time to steep. Take the toast out and drizzle over some olive oil. 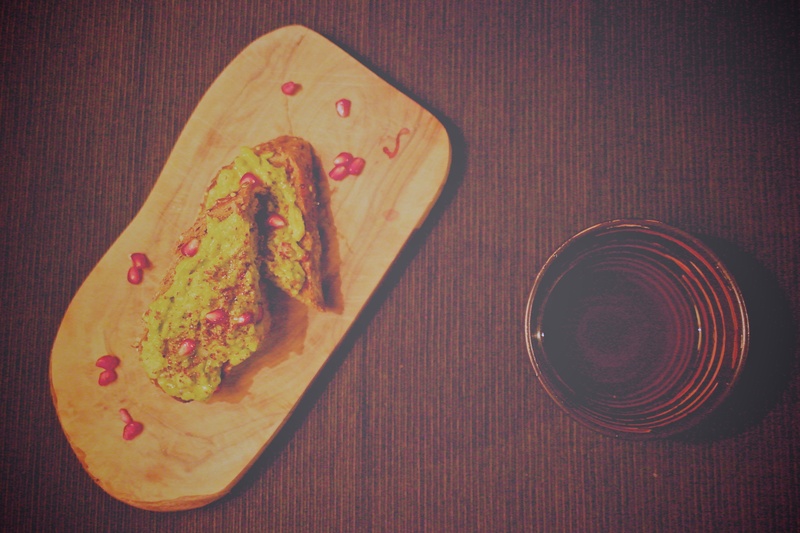 Spread each toast with the avocado and pomegranate mix. Sprinkle over the salt, pepper and sumac, then dot the rest of the pomegranate around. Finish with a little more olive oil. The tea will be ready by now, so sit back and enjoy your breakfast!